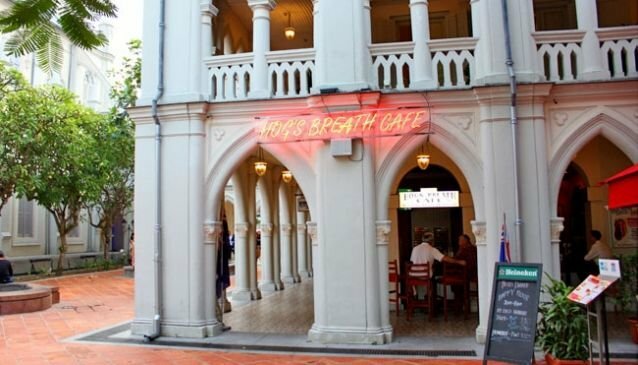 Business travellers feel comfortable and welcomed at this Aussie restaurant housed in the historic Chijmes complex, which features a seated food area, a licensed saloon bar and a merchandise shop. The star item here is Hog's Breath famous grain fed prime rib steak. It is slow cooked for maximum tenderness, then cut to your size, seared quickly on the char grill to seal in the flavour and moisture. It comes in 4 sizes- regular cut, 200gm, Aussie cut at 300gm, Mega cut at 400gm and Super Merga cut at 500gm. There's also a delicious spread of finger foods, salads, pasta, burgers, wraps and sandwiches. Set Lunch menus, available from Monday to Friday, range between S$12++ and S$18++ and include a Main with a garden salad or soup of the day plus a soft drink. Hog's breath cafe is a place for everyone looking for a relaxed and friendly environment in the Civic District.